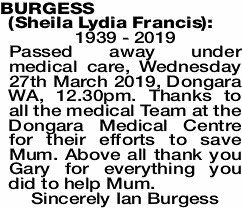 SHEILA LYDIA FRANCIS 1939 - 2019 Passed away under medical care, Wednesday 27th March 2019, Dongara WA, 12.30pm. Thanks to all the medical Team at the Dongara Medical Centre for their efforts to save Mum. Above all thank you Gary for everything you did to help Mum. SHEILA LYDIA FRANCIS Taunted by time, the years slowly passed. Finally, you can be with your one and only true love. Hand in hand for eternity with Ross. You can now rest in peace. Thanks Mum for being there for all our needs, dreams, and the outcomes of our lives. Words can never be enough to say what you mean to us. Rest with Dad in the care of God.